Perched on a high mountain ridge, I looked up at a herd of goats about 500 yards away. The only thing separating us was a sketchy, snow-covered peak that was borderline suicide to cross. A daunting 2,000+ foot vertical fall on either side of the sharp ridge made zero room for error. Dangers aside, all I could think about was getting within shooting range of the herd. 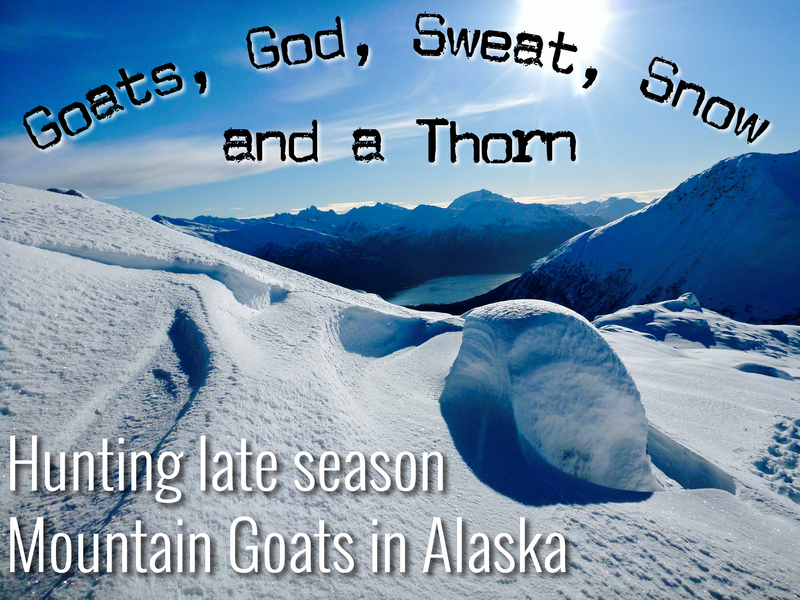 With adrenaline pumping, I said a prayer, swung my ice axe into the mountain, and kicked my crampons into the icy slope towards the goats. 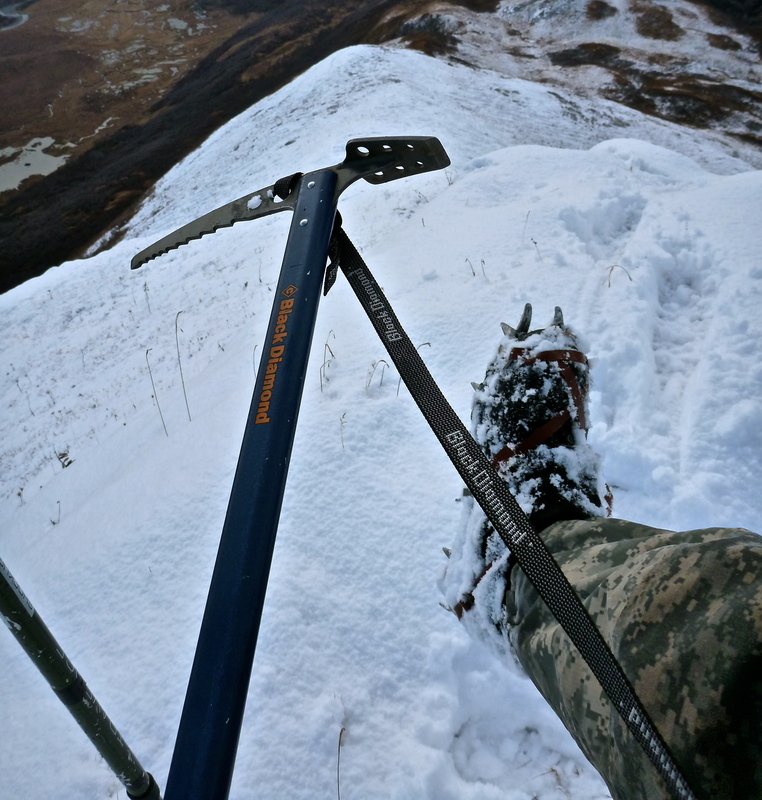 My crampons and ice axe proved to be one of the most critical pieces of gear for the hunt. Blowing snow and drifting fog helped conceal my presence, however offered only brief glimpses of the goats. Half way up the peak I took a final look toward the animals before losing sight of them behind the slope. In that small window I noticed a dark shape below the goats I had not previously seen. At that instant, the fog cleared and the silhouette of a big grizzly materialized. I watched in disbelief as another bear appeared, then another, and yet another. It was a sow with three cubs. Apparently, they also had the goats on their mind. I grit my teeth in agony, as the bears pushed the frightened herd into a craggy glacial bowl, far out of my reach. The bears eventually lost interest in the goats, and unfortunately headed down the ridge towards me. I did not have many options. Cliffs on either side of the ridge left no room to skirt around the bears. Attempting to scare them off at such close range could result in a charge from the largest land-based predator in the world. Disappointed, I was forced to backtrack down the mountain, keeping a wary eye behind me. Although I was upset at the time, in hindsight, the man upstairs must have been looking out for me. If the window in the fog had not opened to reveal the bears, I would have been face to face with them, resulting in either a point blank attack on top of the mountain, or at best, enough pucker factor to last a lifetime. Sometimes things happen for a reason, and I thank God for that. 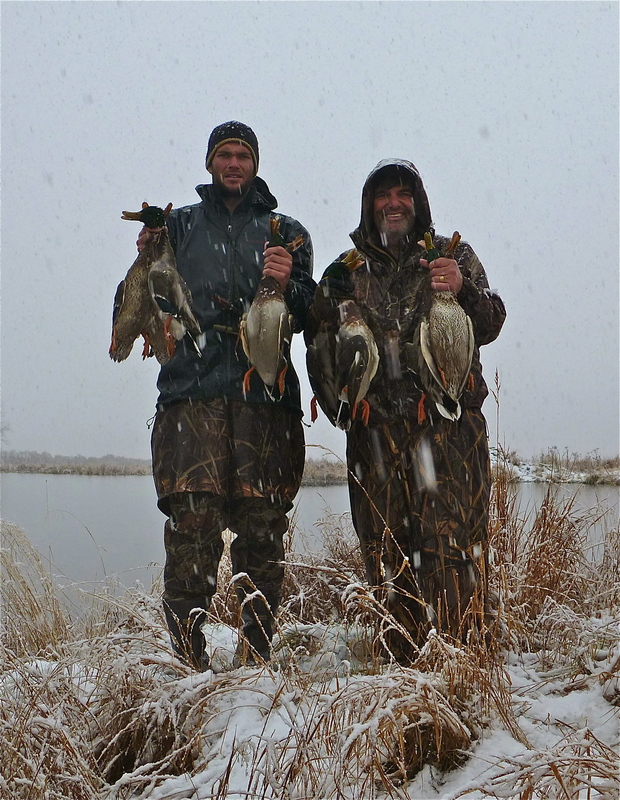 While the snowstorm delayed goat hunting in the mountains, the adverse weather made for great duck hunting and fishing in the lowlands. I had four more days to hunt, but it snowed hard for the next two. The cloud level dropped to sea level, and over four feet of snow (on top of the existing two feet) accumulated in the high country. Needless to say, goat hunting was put on hold. Instead, the days were spent with my father duck hunting the lowland marshes and fly-fishing nearby streams for silver salmon and dolly varden. 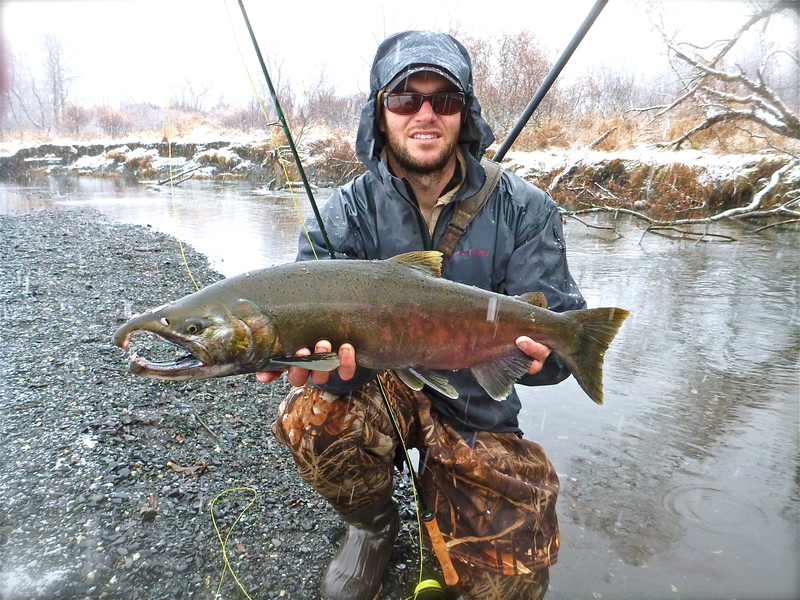 Catching Salmon while waiting out the snow. When the weather finally broke, my gear was already packed and I again set off into the mountains after goats. I only had two days before a bush plane would pick me up, so this trek would have to be light and fast. Snow was about ankle deep on the valley floor and increased with elevation. Soon I was wading through waist deep powder, brush, and steep slopes. With much effort, I got to a great vantage spot, yet could not find the goats. Perhaps the snow pushed them to another mountain? Did the bears return and push them out of the area entirely? Stumped, I frantically searched the surrounding peaks and cliffs for any sign of the goats. Far off on a distant mountain peak I finally spotted some yeti-like objects, which were goats. The herd was so far away, and the travel was so difficult, that I knew it would take a tremendous effort on my part just to reach the animals, let alone successfully make a kill and pack everything out by myself within such a short amount of time. I hiked late into the night and nearing total exhaustion, I dug a hole in the snow for my tent and fell immediately to sleep. I began hiking again the next morning well before daybreak and was pleased to see bright stars shining down through crystal clear skies. At dawn I could see that the goats were still on the same peak and finally starting to look closer. Up, up, up I went and the brush lessened, but the snow deepened. Travel was painfully slow and difficult. I was soaking wet from sweat and snow. The only way to move was to literally crawl on hands and knees up the mountain because of the now bottomless powder. At this point the hunt became more of a quest just to reach the summit, than to actually kill a goat. By mid-day I was a few thousand feet higher and about a gallon of sweat lighter, but I finally summited the mountain. I remained undetected by the goats and was about 400 yards down wind of them. Most of the goats were faced away from me on a cliff overlooking a massive glacial valley. The only way to get close enough for a shot was to sneak down just below the crest of the ridge, and then ease up right on top of them. Stealth and patience were the name of the game. I put on my white painters suite, a white game bag over my entire pack, and as a bandana. With my outfit and walking staff, I probably looked more like a goat herder than hunter. At 200 yards I was still completely out of sight of the goats. 100 yards away I quietly dropped my pack and continued to wade through the snow as quietly as possible. 30 yards and still no sign. At 20 yards I could finally hear the goats scrapping the frozen ground in attempt to forage below me. Now crawling on my hands and knees, I could see curly white hairs from several different animals silhouetted against the horizon.They had no idea I was there. I knew from glassing earlier, that the billy I wanted was on the far left. I raised my rifle and squeezed a free handed shot off into the shoulder. The big billy dropped in his tracks. The shot echoed down the valley and all the goats in the herd perked up with confusion. They didnâ€™t know where the shot came from and ran up on the ridge right at me. I lay frozen until one of them quickly spotted me and they ran off disappearing in another set of cliffs. The old billy collapsed on a small ledge, overlooking a picturesque cliff and deep ravine. It was a rare blue bird day and from the peak you could see the ocean far below and the seemingly infinite surrounding mountains and glaciers. What a beautiful moment, to hold such a grand trophy in such an amazing location. Running my fingers through the long hair, I could not help but to think of all the sweat, work, and good fortune leading up to this. I wish my dad could have been there for it, and I looked forward to getting off the mountain to show him. By the time I had skinned the billy goat and deboned the meat it was late in the day. Time was of concern, as I had to make the bush flight early the next morning. I packed all the meat, head, and hide in my pack and staggered back down the mountain. The deep snow saved much time and effort by allowing me to essentially lunge a few thousand near-vertical feet down the face of the mountain. On more gentile slopes the pack was too heavy to move efficiently, so I shuttled multiple loads of gear and goat the rest of the way out of the mountains. As the night drew on, the full moon reflecting off the snow illuminated my route enough to turn off my headlamp and also helped me keep a careful eye out for bears. Late that night I finally stumbled back to my worried dad. We were relieved to see each other and he was fired up about the billy on my pack. I was on the verge of physical exhaustion (for the second time in 24 hrs), and pretty beat up. Thorns and brush had torn my clothes and bloodied my hands and exposed skin*. I was wet with sweat and blood despite the temperature in the low teens. After getting the meat hung and changing into new clothes, my dad made a massive batch of duck fajitas. If it had not been one of the best tasting camp dinners Iâ€™ve ever had, I surely would have fallen asleep right then and there at the table. 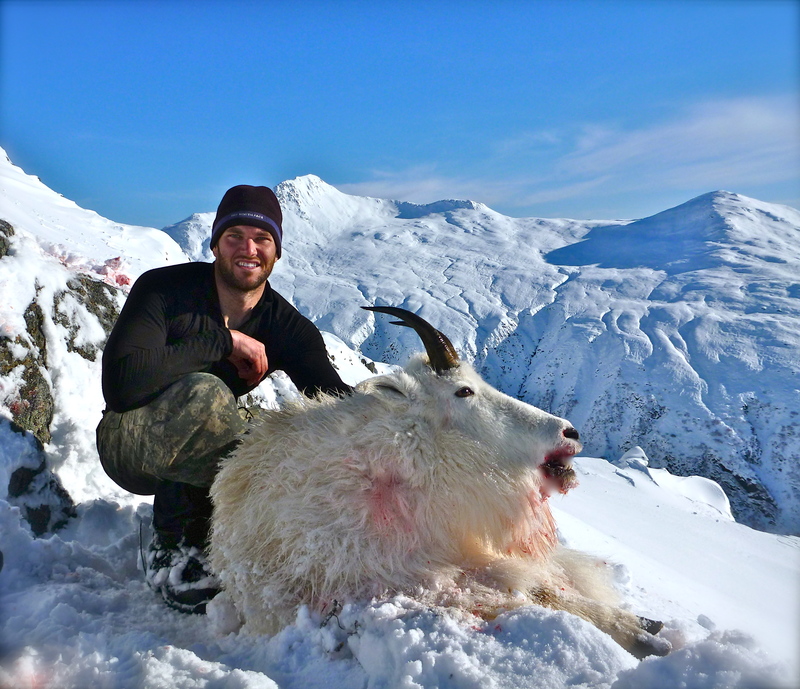 Nobody said goat hunting was easy, and this trip was no exception. But was it worth it? Absolutely. Bushwhacking through thick, thorny vegetation tore up my clothes and hands (top left). As it turns out, a thorn punctured the tendon sheath in my finger and led to a nasty infection, causing my entire hand and arm to swell (top right). 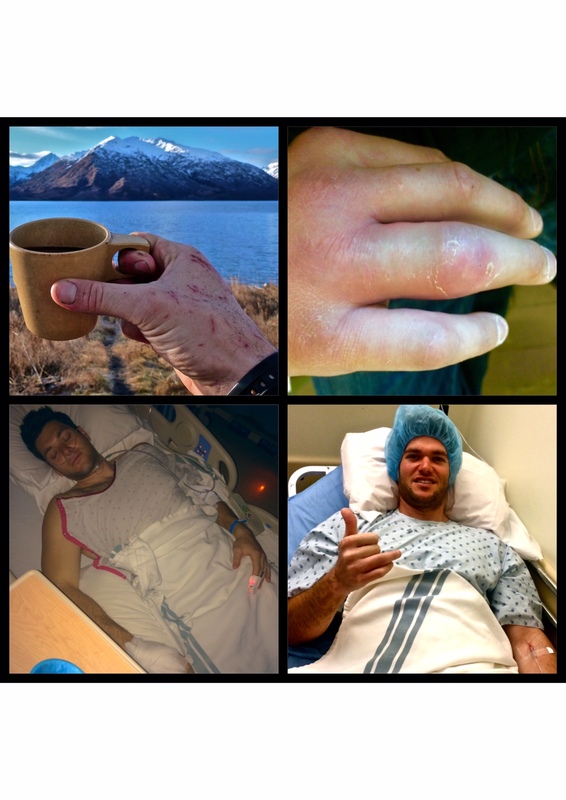 Ultimately the infection required two emergency surgeries to save my hand (bottom left and right). *You might be wondering where the thorn (from the title) comes into this story. During the hunt, a thorn punctured through my finger and into the tendons. Unbeknownst to me, the thorn was laced with bacteria, which infected the tendons. Because I had been exhausted several times in such a short time period from the hunt, my immune system was at an all time low making me highly susceptible to such infections. During the three weeks following the hunt, the infection eventually spread down into the palm of my hand and into my arm. My hand swelled so much it looked like an over-inflated latex glove. After 10 hours in the ER, two emergency surgeries, a night spent in the hospital, and six different antibiotics, the infection appears to finally be under control. It has now been 10 days after my second surgery, and my hand is finally starting to show signs of improvement. However, I have significantly reduced movement in that hand and have had to tediously type this story with only the other.